Florida State running backs Devonta Freeman (left), James Wilder Jr. (center) and Karlos Williams (right) have combined for almost 2,200 yards and 32 touchdowns this season. TALLAHASSEE, Fla. (AP) — Although Florida State does not have a back with the numbers put up by Auburn’s Tre Mason, a trio of Seminoles combined for nearly 2,200 yards and 32 touchdowns while complementing Heisman Trophy winner Jameis Winston this season. Florida State’s Devonta Freeman is 57 yards shy of becoming the first Seminoles back since Warrick Dunn 17 years ago to reach 1,000 yards. Dunn did it three straight seasons. 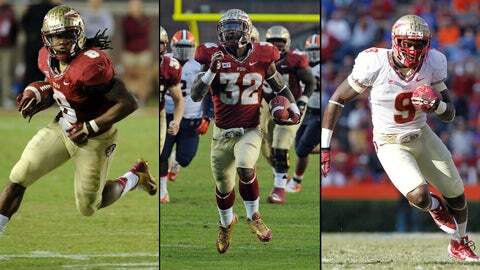 Florida State's underclassmen face a tough decision when it comes to the NFL Draft. "We can run the football," Florida State coach Jimbo Fisher said after a two-hour practice Friday. "That’s one of the things that makes you complete. It’s going to be critical to be able to run the ball." "We’ll start cranking hard now," Fisher said. "We’ll get back in the groove." "Yes they’ve been overlooked," said wide receiver Kenny Shaw, one of three Florida State receivers who could reach 1,000 yards in receptions. "And they’re all great runners." 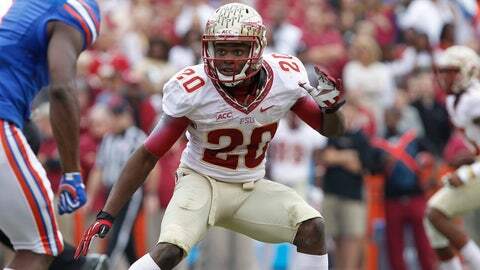 The Seminoles averaged 207.4 yards a game on the ground compared to Auburn’s 327.6, which led the nation. "He’s got a lot of responsibility," Freeman said. "Our fullback has a lot of responsibility. It takes an unselfish guy … making everybody else look good." Williams said Friday he was too mature to accept Fisher’s suggestion his freshman year that he might want to make the move to offense. "It’s worked out for me," Williams said. "I like running into people, make contact. I try to make sure I cause as much punishment as possible running the ball." And that is an attitude that Fisher said has characterized the team’s success in 2013. "This team is playing as any well as any I’ve coached consistently over a long period of time," Fisher said.